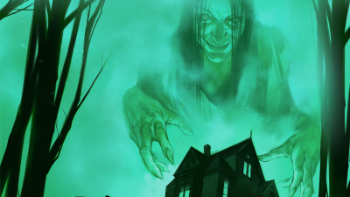 Explore the house and make your character stronger until the "haunt" scenario begins. After that, your goal is to complete your side's victory condition first, either as a traitor or a hero. Set aside the Traitor's Tome and Secrets of Survival haunt books. You'll use them after the haunt is revealed. Each player chooses a character card. There's a different explorer on each side of a character card. Pick one. Attach 4 plastic clips to your explorer card. Each one should point to one of the explorer's GREEN starting numbers for his or her Speed, Might, Knowledge, and Sanity. Shuffl e a stack of omen cards and put it facedown where everyone can reach it. Do the same with the item cards and the event cards. Find the Basement Landing, Entrance Hall/Foyer/ Grand Staircase, and Upper Landing room tiles. Place them from left to right reasonably far apart. Mix all of the rest of the room tiles together and put them facedown in a stack. (Don't worry about which floor is shown on the back of the tiles). Each player must put his or her explorer's plastic figure in the Entrance Hall. (Each explorer's figure matches the color behind an explorer's picture on his or her character card). Put the dice in a pile within easy reach. You'll need them throughout the game. See who goes first. The explorer who has the next birthday goes first. (Look on your explorer's character card to see his or her birthday). Players take turns clockwise following the first explorer. 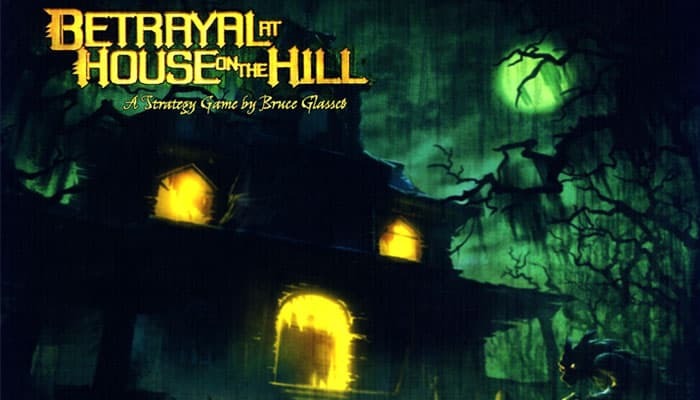 Starting with the first player and going clockwise, each player takes a turn exploring the house. You can discover a new room. You can attempt a die roll. You can use items or omen cards. You can attack (once during your turn after the haunt starts). Before the haunt starts, you must make a haunt roll at the end of your turn if you draw an omen card (see "Making a Haunt Roll"). The game has a few new twists after the haunt starts. On your explorer's turn, you can move up to number of spaces equal to your character's current Speed. Whenever a game effect makes you draw a card, you must STOP moving for the rest of your turn. When your explorer enters a doorway, and there isn't a room on the other side, look at the top tile on the room stack. If it has the name of the floor you are on (ground floor, basement, or upper floor), turn it over and connect it to the doorway you just entered. Then move into that room. Add each new tile as logically as you can, creating adjacent rooms with connecting doors. If the top tile can't go on the floor you're currently on, set it aside facedown in a discard pile. Keep setting tiles aside until you find one that works on your floor. (Some tiles work on more than one floor). An explorer can move through a door if it connects to another door in an adjacent room. Doors are always open. The one exception is the front door. It's always locked. You can't leave the house or use the front door unless a haunt says otherwise. (Outside rooms like the Patio are still part of the house). Staircases connect floors. The Grand Staircase always connects to the Upper Landing. The Stairs from Basement always lead to and from the Foyer through a secret door. (You can't use the Stairs from Basement until you discover that room in the basement). Some rooms also have rules on them, which apply to your explorer each time you enter the room. Some rooms affect movement. A few rooms are clarifi ed in the "Special Rooms" sidebar. A room may have a card symbol on it. The first time you discover a room with a card symbol, you must end your move in that room and draw the appropriate card. If the room has a spiral symbol , draw an event card. Read it out loud. Follow its instructions, which may require you to attempt rolls. Then discard the card unless it says otherwise or has an ongoing effect. If the room has a bull's head symbol , draw an item card. Read it out loud. Place it face up in front of you; you now have it in your possession. You may use it once immediately and once on each of your turns, unless it says otherwise. If the room has a raven symbol , draw an omen card. Read it out loud. Place it face up in front of you; you now have it in your possession. You might have to do something immediately. At the end of your turn, you must make a haunt roll. Many room tiles have rules printed on them, but some of them also have special rules, listed here. The Entrance Hall, Foyer, and Grand Staircase are all on the same room tile, but they count as three separate rooms. This tile moves as soon as you enter it. Roll 2 dice and put it adjacent to a connecting door on the appropriate floor. (If there isn't one, leave the Mystic Elevator where it is). If you roll the same floor, you can move the elevator to a different connecting door on your floor. You can use the elevator only once a turn. Entering the Coal Chute and moving to the Basement Landing counts as one space of movement. A turn can't end with an explorer or monster on the Coal Chute space. (That figure will always slide down to the Basement Landing). Once the Vault has been opened, put the Vault Empty token on it. Only the explorer who first discovers the Collapsed Room needs to make the Speed roll listed there. Thereafter, any explorer entering the room can either ignore the room ability or use it intentionally, in which case that explorer still takes the damage. Falling to the basement doesn't count as moving a space. Only the first explorer to fall to the basement from the Collaped Room draws and places a basement tile. Put the Below Collapsed Room token on the room where the first person landed. Monsters ignore this room's special rules. These are all barrier rooms. A barrier can stop you from moving to the other side of the room. Crossing a barrier requires a trait roll listed on the room tile (either Might, Speed, Sanity, or Knowledge). You can attempt this roll once during your turn. Crossing the barrier doesn't count as moving a space. If you fail the roll, you can't cross the barrier, though you can still move back the way you came. Monsters always ignore barriers. You can use an item once at any point during your turn. 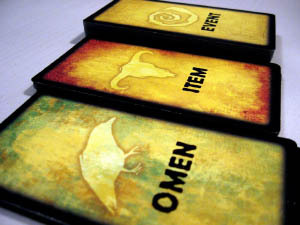 Most omen cards (except the Bite card) are also items you keep, and they're used like other items. Give an item to another explorer in the same room (assuming you both agree). Drop any number of items. (If you do, put an Item Pile token in that room). Another explorer (or you, for that matter) can later pick up some or all of the items in the pile, removing the token if all of the items are picked up. Pick up one or more items from a pile of items. Some items, like the Armor, can't be traded, but they can be dropped or picked up. Some omens, like the Dog, aren't items at all, so they can't be dropped or traded. They're companions that follow the explorer who has custody of them. (The Dog, Girl, and Madman all work this way). Many times during the game, you'll need to roll dice. 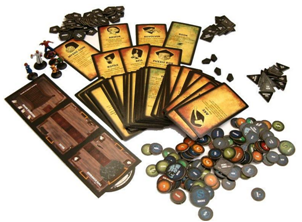 For instance, you might need to roll dice for a card you've drawn or when your explorer moves onto a room tile. If a card tells you to roll a specifi c number of dice, do so and add the number of dots on each die to get the result of the die roll. Then do what the card says for that result. Sometimes a card or room tile tells you to attempt a roll based on one of your explorer's traits (Speed, Might, Sanity, or Knowledge). When that happens, roll as many dice as your explorer currently has in that trait. For example, if your explorer must attempt a Sanity roll, and she currently has a Sanity of 4, roll 4 dice and add the dots together to get the result. Whether you succeed or fail, the card or tile will tell you the results of your attempt. Once during your turn, you can attack an opponent in the same room. You can't attack anyone until after the haunt starts. When you make an attack, roll a number of dice equal to your Might. Your opponent does the same. Whoever rolls a higher result inflicts physical damage to the other explorer or monster. That player defeats his or her opponent. The amount of damage equals the difference between the two rolls. 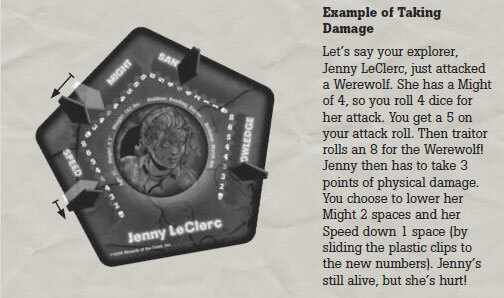 (For example, if you roll a 6 and your opponent gets a 5, you would inflict 1 point of physical damage). If there's a tie, no one gets hurt. When you take physical damage, you lower your explorer's Might and/or Speed traits a total number of spaces equal to the amount of damage you took. Once the haunt begins, if any of your traits (Speed, Might, Sanity, or Knowledge) moves down to the skull symbol , your explorer dies. Before the haunt starts, no one can die-that is, no trait can go below the lowest number on the list (it stays at the lowest value instead). Sometimes a card or a haunt lets you make an attack with a trait other than Might. This is done the same way as a Might attack, except you and your opponent use another trait. For example, if you make a Speed attack, you and your opponent roll dice based on Speed. Speed attacks inflict physical damage like Might attacks. When a card or a haunt lets you attack with Sanity or Knowledge, then you inflict mental damage. You and your opponent move down your Sanity and/or Knowledge traits. You can't use a trait to attack an opponent who doesn't have that trait. For instance, if a monster doesn't have Sanity, you can't make a Sanity attack against it. Sometimes when you attack, you do something other than damage your opponent. For instance, you may be able to steal an item (see "Special Attacks"). Monsters are only stunned when you defeat them, unless a haunt specifi es otherwise. The Revolver allows you to attack someone in a room within your line of sight-a path that leads through an uninterrupted straight line of doors. You take no damage if the subject of your distance attack defeats you. Some monsters can also make distance attacks. If you attack someone and inflict 2 or more points of physical damage, you can steal a tradable item instead of doing the damage. You can't do this with a distance attack. Before the haunt starts, you must roll 6 dice at the end of your turn each time you draw an omen card. This is called a haunt roll. If you roll less than the total number of omen cards all players have drawn this game, the haunt starts. The player who starts the haunt with this roll is called the haunt revealer. 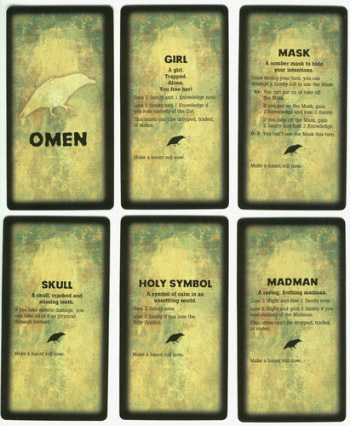 For example, if you draw an omen card on your turn, and the players have already drawn a total of 4 omen cards during the game, you need a result of 4 or less on your haunt roll to start the haunt. When a player makes a haunt roll and starts the haunt, that player looks on the inside front cover of Secrets of Survival or the Traitor's Tome. A haunt chart on that page shows which haunt has been revealed ... and who is the traitor. 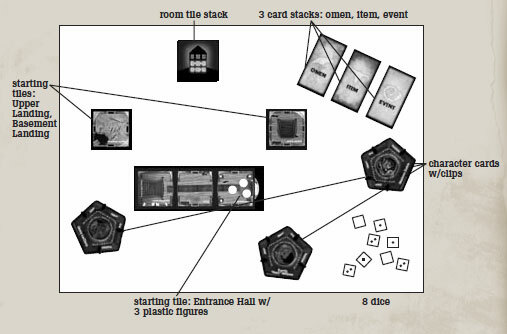 The chart on the inside cover has a list of omen cards (across the top of the chart) and a list of rooms (along the side of the chart). Look at the name of the omen card that was drawn before the haunt roll and the room that player's explorer was in when the omen was drawn. Find the corresponding haunt number. This is the haunt you're going to play. When you find out who the traitor is, give the Traitor's Tome to that player. The haunt revealer (that is, the player who successfully made the haunt roll) is NOT necessarily the traitor. Special Cases: If two or more people could be the traitor, and one of them is the haunt revealer, then that person is the traitor. If neither one was the haunt revealer, then the closest player on the haunter revealer's left is the traitor. The traitor takes the Traitor's Tome and leaves the room. The traitor reads only the haunt that is starting now. The rest of the players become heroes. They look up the haunt with the same number in Secrets of Survival and read it together. (The heroes should also talk briefly about their plan for survival). When everyone is ready (including the traitor), the traitor returns to the room. Both sides (the heroes and the traitor) do anything the haunt told them to do in the Right Now section. 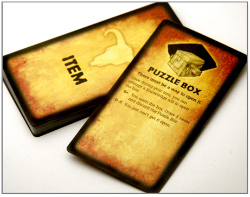 (For example, sometimes you'll have to put tokens in the house or draw cards). The first turn always starts with the player to the traitor's left and goes clockwise (further away from the traitor). Each of the heroes gets a hero turn. After each hero has had a turn, the traitor gets his or her traitor turn. After the traitor's turn, any monsters controlled by the traitor get a monster turn. (One player gets two turns: one for the traitor and one for the monsters). Then the first hero to the left of the traitor goes, and so on. The heroes and traitor are all still explorers. They can do the same things they did before the haunt was revealed, except they don't have to attempt further haunt rolls (even if one of them gets an omen card). The traitor has to tell the heroes what he or she is doing each turn, but not why; the same condition applies to the heroes. After the haunt begins, explorers can die. If one of your explorer's 4 traits moves down to a skull , then that explorer dies. 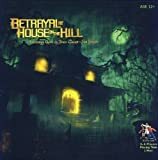 Sometimes during a haunt, a hero will actually become a traitor when he or she "dies". Sometimes the traitor is transformed or otherwise disposed of at the start of the haunt, but the traitor still gets a turn after all the heroes do. Even if the traitor dies, as long as the monsters can complete the haunt's goals, the monsters still get their turn (and the traitor controls them). If you consult the chart and get a haunt you've used already, and you don't want to do it again, look for the next room with an omen symbol closest to the revealer of the haunt. Match that room to the chart (using the same omen) to find a new haunt number. Continue going from room to room this way until you find a haunt that you haven't revealed. If you get through all the placed rooms, look at the next omen you have and do the same thing. 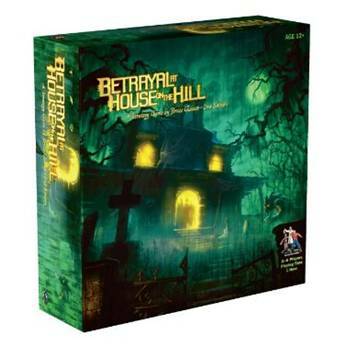 With this optional rule, you can play through all of the haunts without repeating ones you've already played. Don't tell the traitor what your goals are, unless you're sure the traitor already knows them or you're doing something as part of the haunt. Sometimes you have an advantage over the traitor because that player doesn't know what you're trying to do. 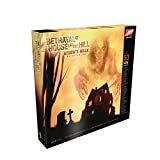 You can still play these haunts again and again after you know how they work, but until then, the heroes shouldn't disclose the Secrets of Survival for their haunt. If you die and you have a companion (the Dog, the Girl, or the Madman), its token stays in the room where you died. Set aside that omen card. If another explorer enters the room, he or she gains custody of that companion (and takes that omen card). When you die, any other items you have drop to the floor. Put an Item Pile token there and set aside those item or omen cards. Other players can go to the room to pick up your items (and take those cards). For each opponent in a room with you after the haunt starts, an explorer must use one extra space of movement to leave that room. An opponent is an explorer or monster that wants to stop your movement. No matter how many penalties you have on a turn, you can always move at least one space. Stunned monsters don't slow an explorer's movement in this way. You can use or ignore any non-damaging room effects or cards you draw. You can walk across the Chasm, decide where the Mystic Elevator goes, leave the Junk Room without rolling, and so on. You can choose not to be affected by an event card. If you choose to be affected by one, though, you have to accept any rolls or penalties. After you fi nish your turn, you move and attack with all of the monsters, if any. Even if the traitor dies, you still control the monsters. In some haunts, the monsters are still able to complete a haunt's goals after the traitor is dead. Monsters behave a little differently than explorers do. All of the following rules are in effect unless a haunt says otherwise. Monsters move differently. At the start of the monster turn, roll a number of dice equal to each monster's Speed. That's the number of spaces that monster can move that turn. For groups of the same type of monster (Bats or Zombies, for instance), just roll once for the whole group. Each monster of that type can then move that many spaces that turn. Most monsters can't be killed. If a monster suffers any damage, it is stunned and misses its next turn. When a monster is stunned, fl ip its token over. At the end of the monster's next turn, fl ip it back. Stunned monsters can't slow an explorer's movement. Like explorers, a monster can attack only once during its turn. Monsters often use traits other than Might to attack. They can't make any of the Special Attacks (again, unless a haunt says otherwise). Like traitors, monsters can ignore all nondamaging room features. They can use the Coal Chute, Collapsed Room, Gallery, Mystic Elevator, and stairs tiles, along with many of the special movement options described on cards (such as the Secret Stairs), unless those cards say that only explorers can use them. They ignore the effect of the Furnace Room and the Crypt. Monsters can't explore new rooms. Monsters can't carry items (unless the haunt says otherwise). If a monster that is allowed to carry items is stunned, it drops all items and puts an Item Pile token in the room. The monster can't pick up the items until it has an active turn. The first side (traitor or heroes) that completes its goals for the haunt wins the game. At least one hero must survive in order for the heroes to win. However, some haunts include goals that are written so that the traitor can still win the game after he or she dies. For instance, the monsters that player controls may be able to win the game without the traitor's help. The game ends when one side completes its goals (listed in the "You Win When" section of the haunt). When this happens, someone from the winning side reads the "If You Win" section from that side's haunt book out loud.